Kammy's Korner: Better Than the Dollar Menu!! Better Than the Dollar Menu!! Tim and I were out and about tonight so decided to use up some of these coupons that we've been getting. 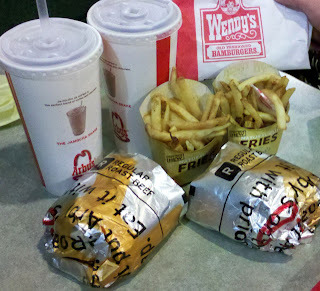 We had to go through the Wendy's drive thru to get the FREE FRIES I told you about last Friday, then I stuck the bag of fries in my purse and we headed over to Arby's where we each had a coupon for a FREE REGULAR ROAST BEEF SANDWICH with a drink purchase. (I'm telling you, you gotta sign up for all those annoying email newsletters, because you never know when they might send you a sweet deal. "Hey, it's the 452nd day of you being an email club member. That must call for a free sandwich!"). So we got ALL THIS for just.... are you ready for this?... $3.16!! That my friends, is better than the dollar menu! Thank goodness Arby's was almost empty so I didn't have to hide my Wendy's bag! haha.